Twenty four local artists, craftspeople and photographers met in the home of one of our founders in East Atlantic Beach in October of 2003 to brainstorm about starting a crafts guild.. Nine of us met in November of 2003 to officially become, West End Arts, a visual artists guild. Over the years our membership had grown from nine original members to an enrollment of over hundreds of artists throughout our 13 years in existence. Since our checking account and our domain name registration were both on December 1, 2003, we consider that our fiscal and social media beginning. 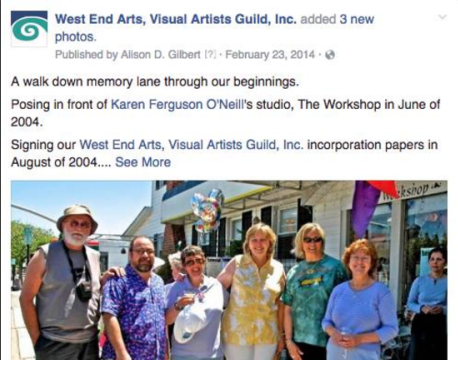 In 2005, our incorporation sealed our name as West End Arts Visual Artists Guild, Inc. forever. The legalities of the formation of our non profit 501(c) 3 organization were the most challenging and satisfying at the same time. WEA started holding monthly art meetings with talented and interesting guest speakers. We also began our legacy of being an interactive, community arts organization by introducing a series of community cultural arts events. In 2004, we started with a mural with the students from the Harriet Eisman Community School. It was painted on the large side wall of the Kings Pharmacy building in the West End in Long Beach, NY. We then held, The Colors of Long Beach, our first major and hugely successful community intercultural events. It was funded by a grant from the NYS Education Dept, courtesy of the former NYS Senator Dean Skelos. 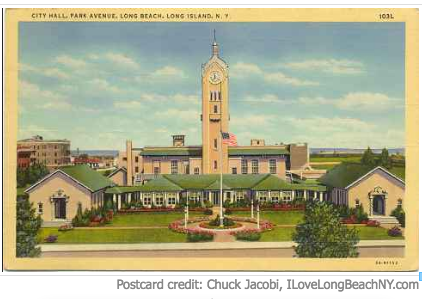 Our members have had group exhibits in Long Beach as well as in surrounding towns. We created the 'Art a La Carte' programs for teens and seniors. Arts in the Plaza, a weekly outdoor seasonal art fair was started in Long Beach's Kennedy Plaza. 'Keep Art in Your Heart', post Hurricane Sandy programs for children began. 'Home Sweet Home' the community post Sandy boardwalk mural was painted and constructed using pieces of the old boardwalk. WEA artists as well as other organizational artists painted pieces of the wood. The entire design was made into a colorful memory to pre Sandy days. Our current public art initiative 'Window Works Arts Walk' is in its beginning stages. We are thrilled to join with the Long Beach business community to enhance and benefit our environment with the spirit and beauty of the visual arts.